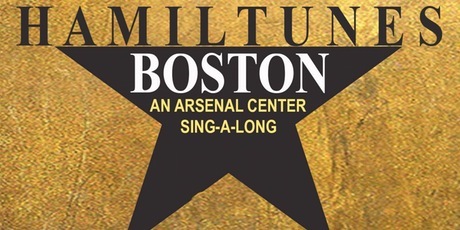 The Arsenal Center for the Arts presents Hamiltunes Boston at the Mosesian, a singalong experience of the hit Broadway musical, Hamilton, on Monday, September 12 and Tuesday, September 13 in the Charles Mosesian Theater in The Arsenal Center for the Arts, 321 Arsenal St., Watertown. Sing on stage by signing up for a vocal slot and be a part of the experience! Tickets and vocal signups open on August 16th. If you don’t want to sing on stage, anyone may sing from the audience at any time, including when soloists are onstage. The Monday, September 12 event is for attendees ages 12 and up and their families. Minors should be accompanied by an adult. Doors will open at 6 pm and the event will begin at 6:30 pm. The Tuesday, September 13 event is for attendees 18 and up. Doors will open at 6:30 pm and the event will begin at 7 pm. Costumes are encouraged, but prop weapons are not permitted. Concessions will be available for purchase at both evenings’ events. There is a $10 suggested donation at the door, and all proceeds will benefit the WCT Tuition Assistance Fund. Limited tickets may be available at the event, but pre-registration is preferred. For more information, visit www.arsenalarts.org or call 617-923-0100.